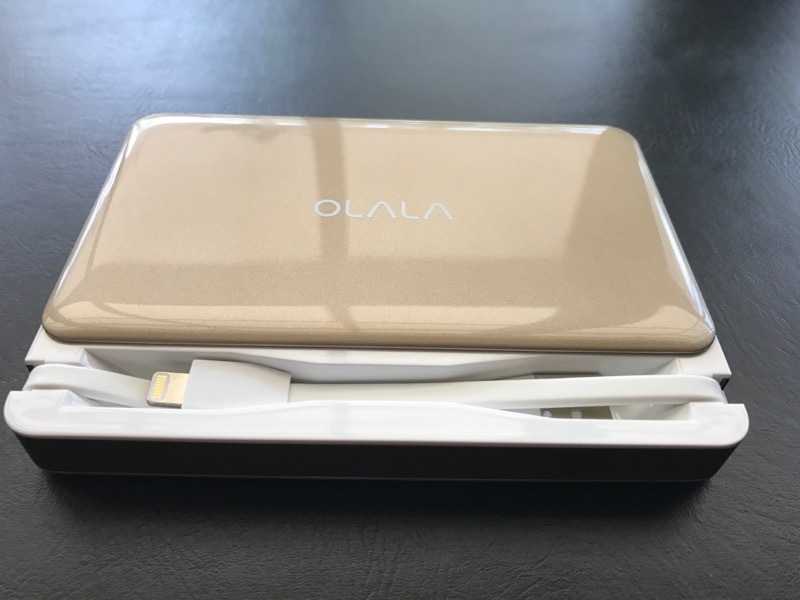 A few weeks ago I was contacted by OLALA about testing out and reviewing the OLALA Power Bank here on 1Wayswim. As someone who relies mostly on iOS devices to stay productive and am always on the go, keeping my devices powered is extremely important...so of course I was interested! What is the Power Bank? The OLALA Slide Power Bank is a 7500 mAh portable battery pack that is MFi certified, which means it is certified to meet Apple performance standards to work with iPod, iPhone and iPad devices. A 7500 mAh battery is pretty significant battery capacity, enough to fully charge an iPhone 7 three times and an iPhone 7 Plus twice. The unique aspect of the Slide Power Bank is the "slide." Built right into the Power Bank under a sliding front cover are two charging cables. The first cable is a lightning cable you can use to charge any iOS device with a lightning port. The 2nd cable is a USB cable, which is used as an input cable to charge the device. Plug this USB cable into a computer port or a charge brick and you can quickly and simply recharge your Power Bank. But the Power Bank can also charge other devices as well. On the outside of the Power Bank there is a USB port. Simply plug in any USB charging cable to this port and the Power Bank will charge any device you connect to it (it provides 5 V 2.4 A of power). The Power Bank also comes with a micro USB charging cable that can either be used to charge devices that accept micro USB or be used to charge the Power Bank using the micro USB input port on the side of the device. Why is the Power Bank so special? Cables are a pain. They are difficult to properly store and carry and tend to tangle and wear out over time. It also seems that despite how many cables you carry with you, the cable you need at the time is the one cable that you don't have. So the biggest design feature of the Power Bank is that it has all the cables you need built right in. Simply slide off the front cover and you have cables that will let you charge all of you iOS devices and allow you to recharge the Power Bank itself. With the sliding cover in place, the Power Bank can be stored and carried as a very compact and sturdy unit without having to worry about carrying additional cables. In my case, I carry the Power Bank in my GRID-IT! sleeve in the back of my Tom Bihn messenger bag. After using the Power Bank for a week I can say that it charges my devices just as quickly as a computer or a wall charging brick. The operation of the sliding front cover is smooth and easy to operate and the integrated cables have just enough length to be useful but not so much to make re-stowing them difficult. Overall I have been very impressed. This summer I will be taking my son on a 500 mile bike ride across Kansas. We cycle for about 75-100 miles each day and then camp at local schools across the state each night. As you can imagine, keeping your devices powered when there are 850 other riders scrambling for power outlets is very challenging. Now, when I do find an available power outlet, I can charge up the OLALA Slide Power Bank and it in turn will top off all of our iOS devices...a much more efficient way for us to handle our charging needs that week. Plus, you tend to be a lot less nervous about leaving a $40-$50 external battery plugged in and charging for a few hours unattended than you do a $1000 iOS device. So if you find yourself running out of power on a regular basis, the OLALA Slide Power Bank is an all-in-one option you should definitely check out.